Members of the Steel Band practice on Monday, Feb. 6, in Cedar Hall. Photo by David Kepler. Steel Band is now a music option that can be taken as a one credit hour class at Kirkwood Community College. The band meets Mondays and Wednesdays, 12:20 - 1:15 p.m. in 375 Cedar Hall. Joe Perea, instructor and director of instrumental music, leads the Steel Band. There are currently about 12 students involved in Steel Band at Kirkwood and Perea said he has additional instruments for students, faculty, staff and members of the community who are interested in trying it out. “I’ve taught this for years with people who have never played a musical instrument before but have always wanted to try something. It’s instant gratification, you take the stick and you tap the note and it makes a great sound. It ends up being a good instrument for people of all backgrounds, of all levels,” he said. 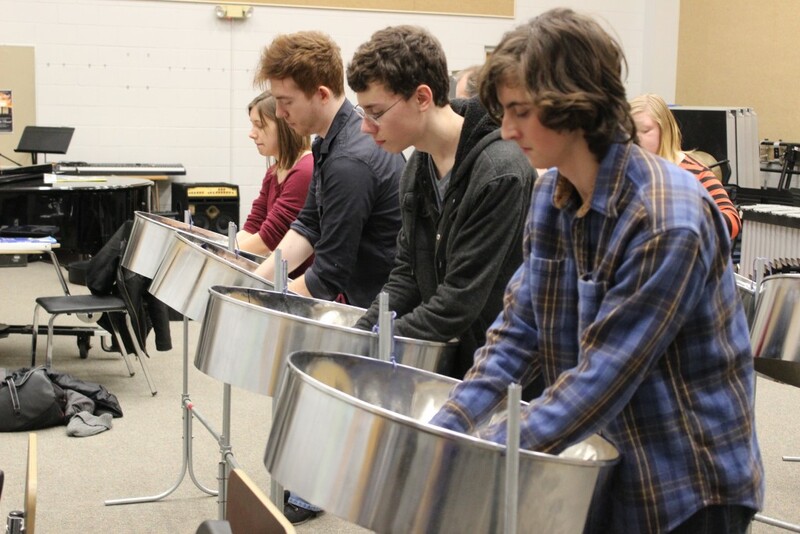 The Steel Band is working toward a performance in The Café area in the spring, as well as a joint performance with Cornell College in Mount Vernon. For more information or questions contact Joe Perea at joe.perea@kirkwood.edu or leave a voice mail at 319-398-5598.